British-born Brian Davis, now an American citizen who calls Orlando home, is the first round leader of the Valspar Championship presented by BB&T. His six-under 65 was one shot better than 2008 Valspar winner Sean O’Hair and veteran Ricky Barnes. Henrik Stenson, #3 in the Official World Golf Ranking, acquitted himself well in his first round on the Copperhead as one of six players at 67. Second round play will be Friday, with the field cut to the low 70 players and ties at its conclusion. After the first round, a total of 79 players stand at even par or better. The lowest cut in tournament history is -1 in both 2011 and ’12. The official tee times for the second round can be viewed here. Saturday will be a special day at the Valspar Championship. In addition to third round competition, the first Valspar LIVE! post-golf concert will kickoff at 7 p.m. on the nearby Osprey Driving Range. The concert features The Band Perry, fresh from their triumph at the Grammy® Awards where their recording of “Gentle On My Mind” won for Best Country Duo/Group Performance. All Saturday golf patrons will be welcomed to the concert free of charge. Ian Poulter, back at the Valspar Championship after a five-year absence, shot a 3-under 68 on Thursday. Poulter, one of the PGA TOUR’s snappiest dressers, is coordinating his outfits each day with Valspar Paint colors. Check him out on Twitter at @IanJamesPoulter. Salamander Hotels & Resorts announced on Thursday a comprehensive enhancements to its famed Copperhead Course that will honor the guiding principles of legendary Course Architect Larry Packard. The six-month restorative work will take place from May through October this year and includes replacing all fairways and rough, rebuilding each green and reshaping bunkers to stay true to Packard’s masterful design. You can learn more about the restoration project here. It was a heart-warming moment at the Pinch A Penny Birdies for the Brave Patriots’ Outpost at the 16th hole on Thursday as pro Billy Hurley III presented a set of his golf clubs and an autographed bag to Master Chief Joe Mulder of the U.S. Navy. Mulder, originally from Sacramento, California, has served 23 years in the Navy. An avid golfer, he was joined at the ceremony by his wife, Diana. Billy Hurley III is the only active PGA player on the tour who has served in the military. Hurley served in the Navy for five years and has publicly supported his appreciation for all branches of the military while on the PGA TOUR. 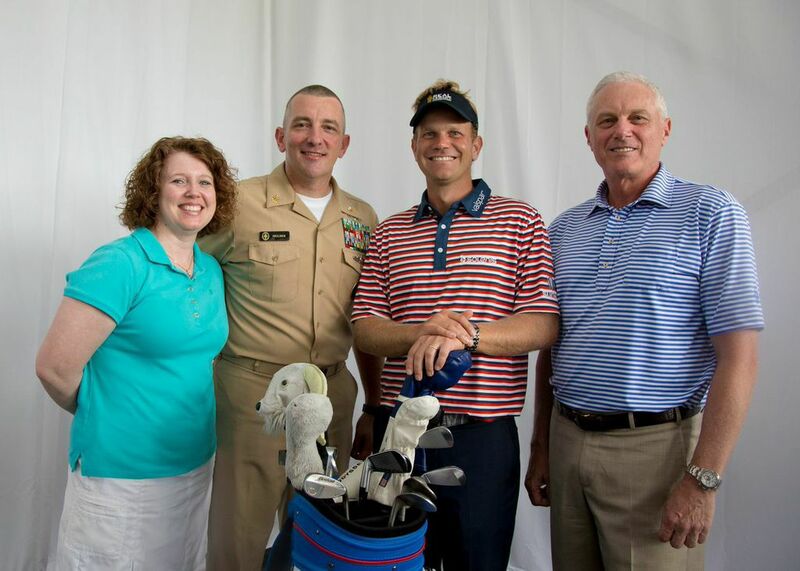 [from right] Gary Hendrickson, CEO, Valspar and PGA Tour golfer Billy Hurley III surprise military fan in attendance Master Chief Joe Mulder, and wife Diana at the Valspar Championship with an autographed golf bag. New Champion Crowned Today, Could Be Same As Old One! Familiar Name Shares The Lead! Copperhead Charities, Inc. is host organization for this event and does not endorse the products or services mentioned within this event or on this site.